Successfully Added Flexible Bluetooth Stereo Headset to your Shopping Cart. Comfortable and flexible Bluetooth stereo headset with on-ear controls for listening to your music through your cellphone and receiving/making calls in comfort and style. This product features a flexible wire-to-over-ear design that is perfect for any head shape and has memory retentive foam for ultimate comfort while wearing throughout the day, and comes with voice dialling and redial button controls, giving you even more versatility in its use. A simple pairing with your Bluetooth mobile phone, MP3/MP4 player, or laptop/notebook computer is all that's needed to enjoy awesome tunes and easy phone calls wherever you are. This model CVSDM-8599 is perfect for people who use computer programs such as Skype and MSN Messenger, or enjoy using their mobile phones to listen to music, while out and about. This is another great product for todays modern lifestyle that is sure to be a popular product. Click "Add to Cart" now and let us express ship you a sample to see for yourself the great performance these bluetooth headset provide. Then list them on your webshop or eBay store front and start making some serious money. On ear controls for listening to music and receiving/making calls. Supports these Bluetooth profiles; A2DP, AVRCP, Hands-free, Headset. Comfortable wireless phone headset and also a great wireless music stereo earphone set. Will This flexible Bluetooth headset work on an iPhone? Yes, You can enjoy listning to you music using the iPod App and make/receive phone calls at the same time. Is this Bluetooth headset compatable with Skype and MSN Messenger? Yes, this is the perfect Bluetooth headset for such applications, this way you are no longer stranded on one position, you can move about freely, and enjoy you conversations on Skype. Here is a list that is currently available of our website, please feel free to check out product codes: CVSB-014, CVSB-K04], TX-Dongle-09, any of these three USB dongles will enable you to pair this Flexible Bluetooth headset with you computer or Notebook. Can I listen music from Nokia N72 Model? Can I listen Radio FM from Nokia N72 Model?? 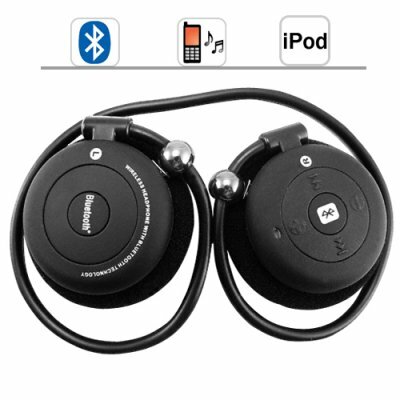 The Bluetooth Earphones support the following Bluetooth profiles:A2DP, AVRCP, Hands-free, Headset. If your Nokia N72 have any of these profiles, then it can be paired with the Earphones. If the devices are paired, you can listen to radio or music on the N72 with the Earphones. The unit is charged with the supplied charger, this connects via USB to mini-USB to the Earphones. on 2010-10-29 11:40:04 This is simply awesome! I really love this head set the sound quality is amazing. This is my first purchase off chinavasion and I must say I am very impressed and will definitely buy off them again. Keep up the good work chinavasion! I use this for listening to music at the gym but I just tried it for talking and it works just as great for that also. I love the fact that it is a headset and not just a single piece but the sould quality is very very good for price. Honestly I know you will not find one better. I live in Florida and Chinavasion has super fast shipping. received units in 3 days!! Thanks Chinavasion for this great product, very easy to use and compatible with my ipod touch! Exellent sound quality (better than the normal ipod headphones) !